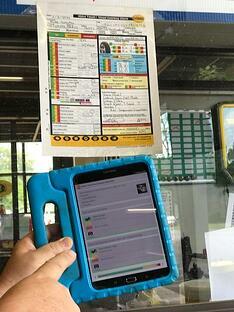 Sometimes, it's hard to keep productivity high in your auto repair shop, especially in the dead heat of the summer. Bays aren’t usually air conditioned, so your team of hard working technicians are in the heat and humidity all day. The team at BOLT ON TECHNOLOGY isn't just interested in making sure your auto repair software is working efficiently, we care that your tech are working as well! These productivity boosting tips can help your team make the most of their work day, which means extra time to service more vehicles and increase profit margins for your auto repair shop. As much as possible, try to maintain a comfortable temperature in the bays and in the shop. Bringing in fans to circulate air is a great way to keep your techs cooler and relieves the build up of stale, hot, humid air in your bays. On days too hot for fans to make much of a difference, consider offering your team bottles of ice cold water or sports drinks. Not only will it help prevent dehydration, it also doubles as a morale booster. Staying hydrated will help your tech keep a clear and focused mind during their work day. It may seem counter-productive to offer technicians more breaks, but on super steamy days giving an extra few minutes for a break will help employees recharge their batteries. Acknowledge your team for a job well done. Letting your staff know you appreciate their hard work will go a long way in keeping them motivated and productive. Communication cuts down on misunderstandings, duplicated efforts, and in the end, saves valuable time (and money!) An easy way to instantly let everyone in the shop know the status of customers’ vehicles is to share it on the team chat feature of Mobile Manager Pro. Doing so eliminates the need for techs to walk to the front of the shop to update the service advisor, which in turn increases efficiency. It's a low energy solution for your body shop. Implementing fully wireless multi-point inspections dramatically cuts down on a technician’s time writing out recommended services through the software’s canned recommendations and canned jobs feature. Making technicians’ work life easier plays a major role in their ability and willingness to be productive. They’ll appreciate the efficiency and you’ll appreciate the productivity. Instead of trying to guess when customers should return for routine services, an auto repair software like Lube Sticker Pro analyzes vehicle driving history to accurately predict when next visits should be set. Appointments are automatically added to the calendar within your shop management system and printed on windshield reminder stickers. Learn how scheduling future appointments leads to better customer retention. When service advisors are busy manning ringing shop phones and waiting on customers, calling to confirm appointments becomes an easily forgotten task. Our Message Manager text messaging software sends appointment confirmations automatically, allowing service advisors more time to carry out other duties. Our Welcome Station self check in software service kiosk empowers customers to not only check in for service, but also select the services they would like to have performed, consider popular and suggested services, and review weather-related suggestions such as windshield wipers during a rainstorm. Check in kiosks ease service advisors’ workflow and help customers choose what work they would like to have performed in a low-pressure format. All of our auto repair software solutions fully integrate with the leading shop management systems, meaning the information collected through mobile devices automatically shows up in your system. Our feature integrations help to simplify processes in your shop management system. Not having to re-enter the data helps shops to get more accomplished faster.